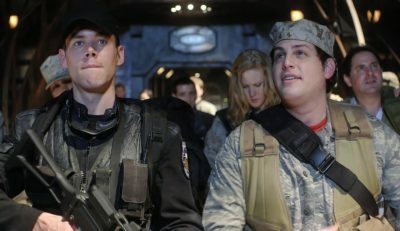 We’re back for the second part of the Stargate Universe premiere three parter “Air Part 2”. In this episode which picks up exactly where the first left off the survivors of Icarus are stranded on the Ancient starship with environmental conditions deteriorating and serious injuries to Colonel Young and Senator Armstrong still life threatening. Rush unbeknown to anyone else takes the communication stones which Young risked his life to retrieve and changes place with Dr Lee, he goes straight to General O’Neill who kinda chews him out for not gating to a known address and thus getting as many people home. When Rush returns he announces he has been given command of the mission and when the Senator objects he collapses, his injuries are far more severe than first thought. As the conditions aboard the ship continue to decline they confirm that damage to the hull has caused extensive use of the ships shields but they are not perfect and the ship is losing atmosphere. The onboard air scrubbers are also well past their prime and their catalyst is useless but at this point the ship drops from hyperspace and the gate console comes to life with at least one world indicated and three more red lined. Rush explains that the ship may have brought them to this system as it contained the materials required to fix the air processors of the ship and there is no time to waste, for some reason a countdown has been initiated until the ship jumps back to FTL. Young puts together a team and explains that everyone has to prove themselves and so he sends Eli along with Rush and other science and military personnel. Air Part 2 is another cracking episode of Stargate Universe, difficult to really judge it as a standalone given it was meant to be part of a feature but the episode has everything. There is great dialogue and character interaction, some mighty fine visual effects and the narrative continues to expand helped by more titbits of information on the ship and the people who are currently resident. Once again we want to think Jeff and Steve for joining us for the show and they will both be back next week.